In 1994, the PlayStation made its debut in Japan and, as of today, Sony Interactive Entertainment has officially sold over 500 million PlayStation family systems total. To be exact, the number has passed over 525.3 million worldwide. To celebrate this huge milestone Sony is rolling out the 500 Million Limited Edition PS4 Pro as a ‘thank you’ to fans all around the world. The 2TB 500 Million Limited Edition PS4 Pro is a gorgeous deep blue with translucent elements. It comes with a matching DualShock 4 wireless controller, PlayStation camera, vertical stand, and mono headset. 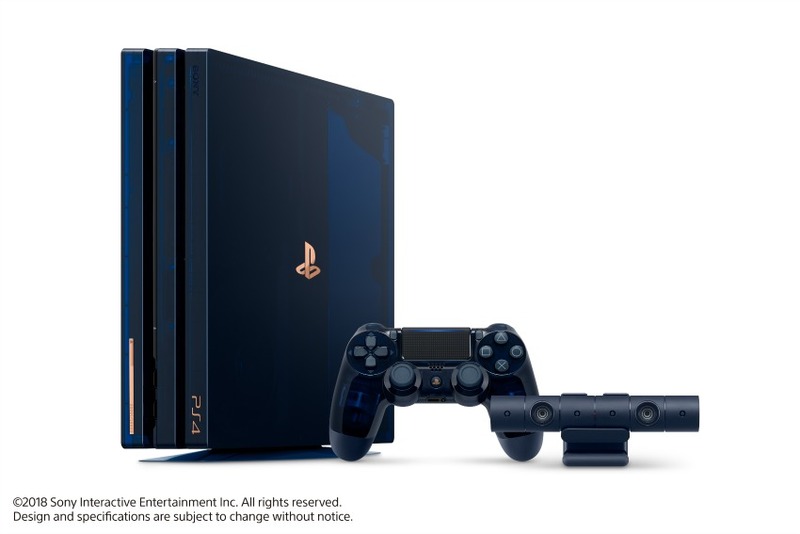 The limited edition system will be available on retailer websites for $499.99 on August 24, 2018, and only 50,000 total will be sold worldwide! The limited edition 500 Million Limited Edition Gold Wireless Headset retails separately at $99.99 and can be purchased in select retailers across the United States and Canada in early September 2018. Note that quantities will be extremely limited. While the 500 Million Limited Edition DualShock 4 does come with the system, it can also be purchased as a standalone item for $64.99. As with the Gold Wireless Headset, it will be sold in limited quantities in early September 2018. Each system will have a commemorative copper plate on its front, with its limited edition serial number etched on. And, for the very lucky few who can get them, we have a few ‘extra special’ hardware units with serial numbers that commemorate important events in the history of PlayStation. Keep your eyes peeled for these ‘extra special’ serial numbers like 09995 (U.S. Launch Date of the original PlayStation – September 9th, 1995), 01115 (U.S. launch date of PS4 – November 15, 2013) and 01013 (U.S. launch date of PS VR – October 13, 2016). Love special console designs? Be sure to check out the Spider-Man PS4 Pro too. Will you try to get your hands on this 500 Million Limited Edition PS4 Pro when it launches on August 24, 2018?